We have gotten to the end of our list of the Most Unwanted Insects. 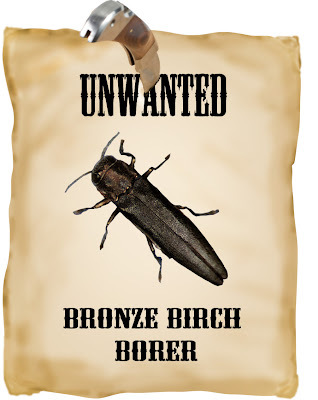 For #1 we chose the Bronze Birch Borer (Agrilus anxius). Why did we choose the Birch Borer for the #1 spot rather than the insects that can destroy an entire tree species? (i.e. the Emerald Ash Borer or the Asian Longhorned Beetle) Because it’s HERE. NOW. And because, as arborists, we’re dealing with damage – often fatal -- from this insect all the time. We all love birch trees. The bright, white, striped paper bark birch is often the first tree we recognize as children. As an understory tree, white birch can light up the forest. Seeing a birch grove in the snow is breathtaking. And other birches, such as river birch with its curling peek-a-boo bark revealing a salmon-colored trunk, are popular planting choices as well. The problem with birch is that they are really not meant for our landscapes. Under the best circumstances, birch trees don’t have lives as long as most of our other trees. And our yards and parks are not the best of circumstances. Birch trees grow best in slightly acidic, moist, well-drained soil. They like sun on their faces but not on their feet. They don’t like pollution. When they don’t have the right conditions, they become stressed; this makes them more vulnerable to both insects and disease. The attacks of insects like the birch leafminer and aphids or diseases like rust and mildew further compromise the tree’s health. This is where the Bronze Birch Borer comes in. The Birch Borer lays its eggs beneath the bark of the birch tree – and prefers to have its path cleared by another insect or other damaging agent first. So Birch Borers rarely attack healthy trees, but can be deadly to trees already experiencing some decline. As the Birch Borer larvae emerge they ravenously eat the underside of the bark, gouging out galleries as they munch. These channels cut through the phloem of the tree, interrupting the tree’s ability to transmit water and nutrients. 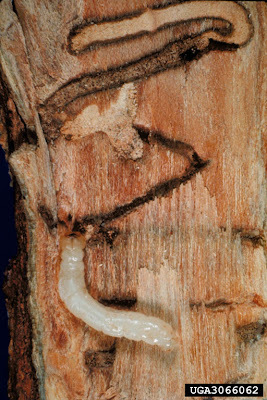 Because the larvae grow beneath the tree bark, often the infestation goes unnoticed until the tree canopy starts to yellow, at which time it can be too late to save the tree. It takes aggressive treatment to halt an attack of Bronze Birch Borers. In an infested tree, the trunk can be injected with a control that can help to stop the larvae from developing. The trunk can also be sprayed with a substance that helps to prevent new insects from colonizing the tree. The correct treatment depends upon the health of the tree, the degree of infestation and the time of year. Not all birch species are equally vulnerable to Bronze Birch Borer. The River Birch, in particular, seems to resist the insect, while the Silver Birch is particularly susceptible. Ultimately, the best way to prevent the Bronze Birch Borer from killing your trees is to keep your Birches as healthy as possible. Birches need deep watering -- weekly, at least. Although the leaves need sun, the roots must stay cool, so a layer of ground cover or mulch will help to insulate them from the heat. We recommend checking Birch trees frequently for signs of pests and disease. Any yellowing leaves or dieback could indicate a potentially fatal problem; early intervention can sometimes avert a fatal infestation.